YX-330 Ridge Cap Forming Machine YX-330 Ridge Cap Forming Machine This product is widely used in many kinds of industrial factory, civilian buildings, and wall board for attached part product. It has advantage of pretty appearance, durable using and so on. It is producted continuously as roll forming machine instead using bending machine to make angel tile saving human resources, lower labor cost. YX-460 Ridge Cap Forming Machine YX-460 Ridge Cap Forming Machine This product is widely used in many kinds of industrial factory, civilian buildings, and wall board for attached part product. It has advantage of pretty appearance, durable using and so on. It is producted continuously as roll forming machine instead using bending machine to make angel tile saving human resources, lower labor cost. This machine is composed of automatic discharge table, feed leading table, main forming machine, cutting device, hydraulic station and computer control system. Optional system are normal uncoiler and hydraulic uncoiler. 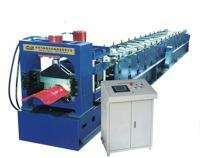 Our company is specialized exporter, manufacturer and supplier of Ridge Cap Forming Machine in china.